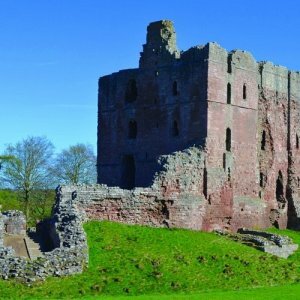 Norham was one of two border castles, with Wark-on-Tweed, which were besieged during the early stages of the Scottish Invasion in 1513. Starting on 21st or 22nd August of 1513, James IV crossed the border in force at the head of a large army. Norham CastleWhile Wark is likely to have been approached directly from Duns, with the crossing at Coldstream witnessed by the Nuns of Coldstream Priory, the approach to Norham could have been made from Wark or Coldstream, along either bank of the Tweed, or by a force marching from the Whiteadder Valley via Chirnside to the Ladykirk bank of the Tweed opposite Norham. While there is no written account of a siege at Wark, the taking of Norham meanwhile warranted a long description in contemporary accounts which described a devastating bombardment lasting up to 5 days, interspersed with major infantry assaults. It is understood that the Scottish Army was finally successful when the English Captain defending the besieged keep surrendered his command having run out of ammunition. Ladykirk and Norham. Roy’s Military Survey of Scotland, 1747-1755Several detailed topographical and buildings surveys have previously been undertaken, notably by Raine (1852), the Ordnance Survey (1860), Dixon (Dixon and Marshall 1993) and English Heritage (Pearson and Ainsworth 2002), along with some clearance of the interior by the Office of Works in the 1920s, after the castle was taken into guardianship in 1923, and again in the 1950s (op. cit. 7 & 8). Descriptions and histories based on these surveys and enhanced by documentary sources include Clark 1876, Hunter-Blair and Honeyman 1966, Northumberland County Council 2001, Raine 1852 and Saunders 1997 & 1998). In common with many of the major castle sites in Northumberland (notably Harbottle, Newcastle and Wark) which are known or suspected to have been sites of earlier occupation, earlier settlement at Norham is considered likely but, despite the recovery of prehistoric artefacts from the castle complex (Pearson & Ainsworth 2002, 7), remains unproven. There was certainly a Roman presence, probably including roads, along the south bank of the Tweed (Bishop 2014, 89, 169-70), and an earthwork bounding a large field south of Norham castle has been suggested as dating to this period, but a recent English Heritage survey of the site has now identified this as a likely iron age feature (Pearson & Ainsworth 2002, 9 & 18-19 & 36-37). The recorded origin of the castle site is as a motte and bailey earthwork castle built for Bishop Ranulph Flambard during the reign of Henry I (1100-35) in about 1121. King Henry II first took the castle into Crown hands in 1174, establishing a precedent for taking the castle into Crown hands during periods of national military crisis, first repeated by King John in 1208. Despite its capture after prolonged sieges by Scottish forces in 1327, the castle remained relatively unchanged between the end of the 12th and early 15th centuries, when considerable additions were made, followed by further strengthening of the defences around 1495 (Pearson & Ainsworth 2002, 12). Thereafter, as at Wark, successive spells of royal tenure mean that works on the castle are recorded in considerably more detail than would be the case for a lesser baronial castle (see sources for Wark Castle in Carlton, this publication), including a series of major repairs and alterations carried out in the aftermath of the Flodden campaign when the accounts of the English Government of Henry VIII suggest that both Wark and Norham were taken into direct ownership of the crown and extensively renovated and remodelled as artillery fortifications, rather than traditional, medieval castles. Henry’s administration was investing in both sites as ‘frontier artillery posts’ (Saunders 1997, quoted by Pearson & Ainsworth 2002, 13); places where power could literally be projected over the border both by means of artillery and by stabling mobile cavalry forces. Extract from the 1:2500 2nd Edition Ordnance Survey Plan of 1898, showing Norham Castle and the study area Right: Lidar view of earthworks in and around Norham castle site showing rig and furrow entirely covering the field south of the castleAlthough several detailed topographical and buildings surveys have previously been undertaken, until 2005, when a small trench was cut across the east side of an earthwork bordering the field south of the castle (Brightman & Waddington 2013), with inconclusive results, no excavation work has previously been carried out in the castle or its environs other than some clearance of the interior by the Office of Works in the 1920s, after the castle was taken into guardianship in 1923, and again in the 1950s (op. cit. 7 & 8). Descriptions and histories based on these surveys and enhanced by documentary sources include Clark 1876, HunterBlair and Honeyman 1966, Northumberland County Council 2001, Raine 1852 and Saunders 1997 & 1998). Norham and Ladykirk fieldwork sitesThe principal aim of archaeological fieldwork carried out at Norham and Ladykirk between 2012 and 2015 was to identify and record traces of siege works, temporary camps and defensive installations active at the time of the 1513 campaign, prior to the post-Flodden remodelling of Norham castle mentioned above. Accordingly, excavations at Norham and Ladykirk in 2013 were guided by a geophysical survey carried out in 2012 during the HLF development phase of the Flodden 500 project. The survey at Ladykirk focussed on the area immediately east and south of the church, while at Norham it covered the full extent of a large field south of the castle, including the part currently protected as a scheduled ancient monument which contains features recently recognised as associated with a 16th century remodelling of the castle. These were the first significant excavations to have taken place on or adjacent to the castle site. In 2013 three trenches were opened in the east part of the south field in response to potential geophysical anomalies. Trench 1, on the south side of the field, examined a potential defensive earthwork, recorded as a possible rampart of an iron age promontory fort in the English Heritage survey of 2002, postulated to have stood along the north side of the Mill Burn Valley. Although an insubstantial linear feature was recorded here which could be interpreted as the remains of a palisade slot, it is thought equally likely to be the remains of a later fence line, perhaps replacing the current earthen bank of which scant traces remain. The interpretation of this feature as an iron age rampart remains unproven. Trench 1 excavated in April 2013 viewed from the south with castle in the backgroundTrench 2 was placed across the eastern of two large gradiometry anomalies, initially interpreted as hearth features, in the middle of the field south of the Castle’s south entrance,. These appeared to be linked by a V-shaped feature, with its tip pointing at the southern wall of the castle and interpreted, prior to excavation, as a possible siege work. Excavation revealed an area of hard standing formed by densely-packed riverine cobbles, with indications of light industrial activity upon it, principally in the form of lead working represented by numerous examples of lead micro-marbles - produced by pouring boiling lead - as well as other artefacts including spindle whorls, shrapnel and arquebus balls, suggesting light industrial activity in the 15th – 17th centuries. Beneath this level were gulleys which were initially interpreted as the remains of foundation trenches, possibly for a plank built building, but this interpretation is far from clear and an agricultural origin appears just as likely. On the basis of limited pottery and a small horse shoe, the remains underlying the hard standing are thought to date to the 13th or 14th centuries. Trench 3 was opened over the western arm of the V-shaped feature identified by geophysical survey slightly to the west and north of trench 2. Here was found a compacted gravelly surface under modern plough-soil with ard marks similar to those seen in Trench 2 within it and post-medieval rigs visible in the topsoil above. Although the character of remains was sufficiently similar to those in Trench 2 to suggest that this area, too, may have been used for open air light industrial activities, little direct evidence for this was found. Overall the results of the 2013 excavations suggested two things. First, that the field south of the road was used as an adjunct to the main fortification, possibly forming a large southern ‘outer’ ward. Second, the presence of lead working and particularly the recovery of arquebus balls and shrapnel suggest the area may have been used after 1513 during the process of remodelling the castle as an artillery fortification. Accordingly, a second series of excavations were carried out in September 2015 on the north side of the river Tweed in a field to the south of New Ladykirk, directly north of Norham Castle. The purpose of these exploratory excavations was to examine an area where geophysical survey carried out in September 2014, and a metal detecting survey in early 2015, had identified potential siege works in a location which made better tactical sense than that initially proposed at project planning stage, upon which basis investigations were carried out adjacent to Ladykirk church in 2013. Metal detecting finds in the fields to the north of the river included projectiles of lead and lead composite and include 1½” falconette balls and slightly larger 2”, 2lb ‘cannon’ balls. All are thought to be English and appear to have been fired from the castle, suggesting that they represent out-going fire from the castle discharged during infantry assaults, potentially in the later 15th or early 16th centuries. Excavations carried out over a number of geophysical anomalies in the arable field where metal detecting had located the projectiles noted above failed to uncover any significant archaeological remains, recording only field drains cut into the natural sub-soil and finding no artefacts. Two test pits excavated on terrace-like projections in a pasture field immediately to the south also failed to produce results of archaeological significance. Therefore, with respect to potential siege or camp positions on the north side of the river, no significant remains have been found to provide substance to suppositions based on local tradition, topographical observation and limited artefactual evidence, although it remains likely that a camp and siege positions were present here. Suggested positions include a valley hidden from view of Norham Castle, formed by a fold in the hilly riverbank south of the area at New Ladykirk just described, and a projection on the river terrace south-east of the church, noted above. However, it also remains open to question whether any substantial, detectable traces of siege and encampment positions would be detectable on intensively farmed ground after a period of 500 years. The absence of siege positions on the north of the river could, alternatively, be taken to imply that the castle was besieged not from the north, but from the west, with the Scottish army approaching along the south bank of the river from Wark, having crossed at or near Coldstream (or, indeed, at Melrose; an option considered by Caldwell in this volume). A number of earthwork features visible in and adjacent to the protected scheduled area at the west end of the field south of the castle, including what is clearly a prominent bastion in the north-west corner of this area, clearly form an integral part of the castle complex and have long been thought to be related to the post- Flodden outer defences of the castle but could, alternatively, be the positions of earlier defensive or siege works, at least in part. Some have also long been considered the remains of a 17th century settlement on the south side of the castle ditch, but underlying them are features which in the first and second edition OS maps (1860 and 1897) are identified as the remains of ‘intrenchements’, suggesting that they were viewed as the remains of Scottish Army siege works from the late 15th or early 16th centuries. Looking west towards Norham village over the 2015 excavationsThe English Heritage Survey carried out in 2002 (Pearson and Ainsworth 2002) accurately mapped the surface form and extent of these features and drew conclusions about their function and dates which, though not unreasonable, are not based on any direct evidence other than their form and comparisons made with other sites. Therefore, it was agreed that the only means to verify the conclusions of the earthworks survey was by means of targeted excavation, which was duly carried out in July 2015. A total of six trenches were opened within the area of earthworks occupying raised ground opposite the castle, but delays in receiving permission meant that only two were in the Scheduled Area. Looking west towards Norham village over the 2015 excavationsTrench 1 was positioned on a steep-sided projecting platform at the south-west corner of the earthworks complex, which has been interpreted as the remains of an earthwork bastion, representing an artillery position similar to the better preserved example closer to the castle mentioned above (and see description of Trench 6, below). Excavation here revealed no significant remains other than a spread of rough cobbling which could be interpreted as hard standing but is more likely associated with the later parish boundary bank which runs north from this position. Finds from this site included sparse shards of modern pottery, the earliest being a small shard of slip ware dateable no earlier than the 17th century, but probably later. Trench 4 was positioned across a linear bank forming the west side of the large emplacement enclosure which now forms part of a longer bank, running southwards from the north side of the presumed southern bastion towards the river and truncated by the modern road. The lower, south section (and possibly its north end, too) is thought to be a later continuation of the west side of the emplacement, added after the abandonment of the holloway to the south gate to demarcate the parish boundary. Excavation showed it to be comprised of redeposited clay and earth but no sign of a palisade was recorded, nor any finds to date it. In summary, fieldwork carried out at Ladykirk with the aim of deducing whether the Scottish army of James IV besieged Norham castle from the north side of the Tweed, or crossed the river to besiege it from the English side, has proved inconclusive. Although fieldwalking recovered good quantities of medieval pottery from a field south-east of Ladykirk church - itself reputedly built as a defensible structure by James IV at the turn of the 16th century – no indication of 16th century military activity was found during fieldwork, which included excavations, within and close to Ladykirk village itself. And while some ordnance of the late medieval period was found by metaldetecting in fields almost opposite the castle on New Ladykirk grounds, geophysical anomalies explored by excavation there in September 2015 proved to be natural in origin. While inconclusive, the process of carrying out fieldwork at Ladykirk has helped to narrow down options for further enquiry and prompted discussion about the sort of (probably quite ephemeral) remains that would be expected to survive following use of 16th century artillery in the field. In particular, the site of an earthwork of presumed medieval date, overlooking the Tweed just over a kilometre from Norham Castle, is now thought a likely point from which the siege of the castle may have begun, while fording points for the army have been identified at the present bridge and close to the castle itself. Excavations carried out following geophysical survey on the south side of Norham Castle uncovered signs of later medieval and post-medieval activity there, suggesting that all or most of the current large pasture field there functioned, from as early as the 12th or 13th century, as a kind of outer ward of the castle, perhaps brought into use during periods of intense military activity or preparation. Areas of metal-working and, potentially, temporary settlement were identified in the central part of this site while in the west, where a complex of earthworks is visible, a number of military and domestic structures were dated to the 16th century and later, suggesting that the earliest remains were contemporary with the post-Flodden remodelling of the castle as an artillery fortress. The results of excavation at Norham suggest that the reordering of the castle in the wake of Flodden anticipated attack from the west (village) side and support the idea that the large area between the south side of the castle and the Mill burn was used, at various times, as an area for temporary billeting of troops and associated small-scale domestic and industrial activities. Its putative earlier origins as an iron age promontory fort remain unproven. Brightman J and Waddington C, 2013, Evaluation of an earthwork at Norham Castle, Northumberland. Archaeological Research Services Research Paper 2. Dixon P and Marshall P, 1993, The Great Tower in the Twelfth Century: The Cast of Norham Castle. Archaeological Journal 150 (1993), 410-32. Northumberland County Council, 2001, Norham: An Archaeological Assessment. Unpublished Report. Pearson and Ainsworth 2002 Norham Castle, Northumberland. York, English Heritage. Clark, G.T. 1876. Norham Castle. Archaeological Journal 33: 307-324. Jerningham, H.E.H. 1883. Norham Castle. Edinburgh, William Paterson. Hunter Blair, C.H. and Honeyman, H.L. 1966, Norham Castle. London, HMSO. Raine, J. 1852. The History and Antiquities of North Durham. London. Saunders, A. 1997. Norham Castle and early artillery defences. Fort 25: 37-59. Saunders, A. 1998. Norham Castle. London, English Heritage.